A new government survey of prison inmates shows what the industry already knows to be true. Criminals rarely obtain their firearms from retailers. 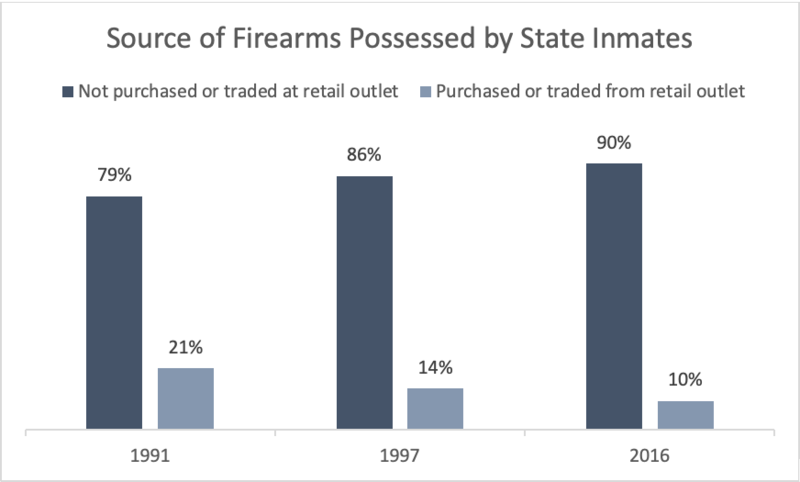 In fact, over time, the share of criminals’ firearms that come from retailers has dropped by 10 percentage points. This Bureau of Justice Statistics survey has been done periodically, in slightly different formats multiple times since 1974. While the latest survey covers federal inmates as well, our chart above compares only the state inmate data, which has been a consistent metric over time. This apples-to-apples comparison reveals that only 10 percent of criminals obtained their firearm from a retailer. Of that small and declining share, the survey shows that about 7 percent of inmates used their own names when purchasing a firearm from a retailer. This raises the important question of whether they were already prohibited persons, but the relevant records were missing from the background check system. Regardless, the survey found that about 1.3 percent of prisoners obtained a firearm from a retailer and used it in their offense. Despite the new round of so-called “Assault Weapon Bans” being introduced in Congress and several state legislatures, the survey found that handguns were the most common type of firearm used or possessed by criminals in 2016. Perhaps lawmakers should spend less time on these “solutions in search of a problem” and more time on fixing the background check system, or on any of the issues that voters actually rank as a priority.